The Philadelphia Area Consortium of Special Collections Libraries (PACSCL) CLIR Hidden Collections project focuses tightly on historical collections that document the development of Greater Philadelphia -- Philadelphia, its adjacent counties, and its web of connections in the Delaware and Lehigh Valleys -- as one of the country's preeminent industrial, commercial and cultural centers during the nineteenth and twentieth centuries. 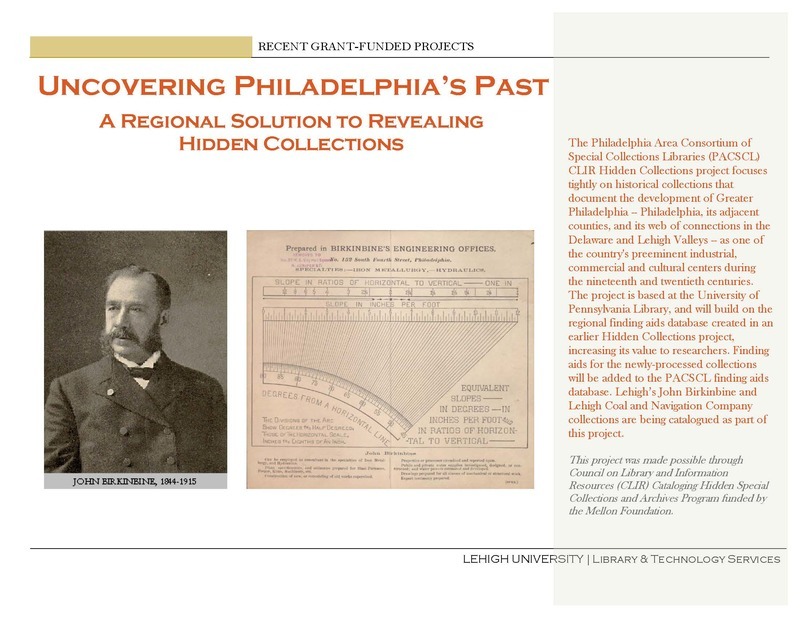 The project is based at the University of Pennsylvania Library, and will build on the regional finding aids database created in an earlier Hidden Collections project, increasing its value to researchers. Finding aids for the newly-processed collections will be added to the PACSCL finding aids database. Lehigh’s John Birkinbine and Lehigh Coal and Navigation Company collections are being catalogued as part of this project. This project was made possible through Council on Library and Information Resources (CLIR) Cataloging Hidden Special Collections and Archives Program funded by the Mellon Foundation.